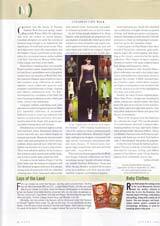 Contrast was the theme of Toronto Fashion Week this past spring, resulting in Fall/Winter 2003/04 collections that were the richest in recent history. Canadian designers set aside the worries of business long enough to be inspired by the significance of world and social events. They sited diplomatic stand-offs, imperialism, and the fragility of peace and beauty as the inspiration for conceptual runway stories entitled Code Red, Clair-Obscur, Women of the Land, Urban Jungle and Dust of the Earth. David Dixon's standout show was set at the Royal Canadian Legion. Inspired by a love letter that Dixon's grandfather sent to his grandmother from the trenches of World War One, the seasoned designer graced both his men's and women's wear collections of orderly capelets, naval collars and spencers with romantic embellishments of fringe, beading and ribbons emblazoned with "No War". Accompanied by a recitation of the letter, his was a haunting meditation in navy, black and white, on love, war, and beauty. Long grey military marching coats, suits and chevron-patterned jackets launched Thien Le's masterful collection of menswear. Tailored women's wear was softened with touches of pink in lace and jersey. Inventive tuxedos shared the finale with gorgeous garnet plaid evening skirts and bustiers. Introduced at a construction sight in a seedy west end hotel, Arthur Mendonça's debut collection was both racy and refined despite its inauspicious locale. Menswear was uncomplicated, with suits and jackets in velvety brown corduroy, denim and soft wool, while rich waxy leather was lavished on a men's wrap trench. There were admirers aplenty for his women's line as harem pants, gowns and a slinky jumpsuit in burnt umber satin sealed the deal. In make or break fashion Fong's C'est Pas Grave burst onto the runway in impulsive red! The Montreal designer enlivened this already strong week of menswear with his collection of daring suits, shirts, trims and collars in the ultra radical colour. Noteworthy was a jacket of burnt-out boiled wool, in red of course. In the Urban Jungle inhabited by Denis Gagnon, male and female are prepared for the uncertainties of modem life. Suited up for street combat or a close encounter with a prize rose, ankle-gathered khaki pantaloons and soft satin-edged pink chiffons are wrapped, draped and belted in an homage to the middle ages. As an "expression of uneven and imperfect beauty". YSO's Siphay Southidara invoked the muses to create a predominantly black and white collection. Montreal's beguilingly androgynous designer commanded the sage velvets, wool jerseys and pleated silks, into tunic dresses, "Y" braced minis. burgundy high-necked body suits and stick thin pant suits ... to perfection. When hip hop dancers opened the FurWorks and Design Network collections, we knew something was up. Canada's dynamic designers, notably Dominic Bellissimo, Tavan and Mitto, Renata Morales, heralded the re-entry of fur as a medium with their shaved, knit, marbled, sculpted, and feathered displays. Sweet and precious, Shelli Oh's Harebell was a collection of fragile dresses in pastels of beige and blush georgettes and gauzes. Delicate Edwardian details blended with 60s primness to create an enchanting if not practical line up for the Canadian winter. A quick glance at Paul Hardy's line sheet revealed Mongolian cashmere, goat suede. angora, paper silk, metal organza, and shearling as the luxury materials for his tactile collection. This Calgary designer created a cocoon of comfort with taupe sculpted handknit shrugs and long jersey skirts. Atop a downtown club, Jennifer Dare's Layer collection was such a hot ticket organizers scheduled two consecutive shows to appease the crowds. A deftly executed lineup of leather capris, A-line skirts, bustiers and high-necked jackets were accented with cleverly attached pocket belts highlighting her spare and artful pieces. Possibly the ideal of urban sophistication. Marie Saint Pierre's designs are cherished by artists, writers and cultural leaders. She chose jersey for ease of movement in her ponchos. slim skirts, pants and tight little jackets. Lilac and yellow imbued her blacks and greys with the joy of femininity. "What if the designer were the band and the collection the song?" This was the premise of Crystal Siemens' Heavenly Creatures video. featuring feathery fur tops, tight knits, leather skirts and gracefully ribboned chiffons. Always a trailblazer, Siemens took a bold step by partnering with Fashcam on their first fashion video. I was intrigued, but prefer the palpable. Is this the new format for fashion presentation? The jury is still out. Given the creative direction in concepts, styling, and offbeat venues of this fashion week, I'd say that the runway show is blissfully here to stay.